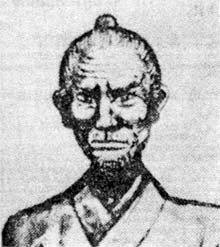 Sokon Matsumura (1792-1890) was the forefather of Shorin Ryu..
Matsumura was recruited into the service of the Sho family (Royal family of Okinawa) and eventually became the chief martial arts instructor and bodyguard for the Okinawan King. 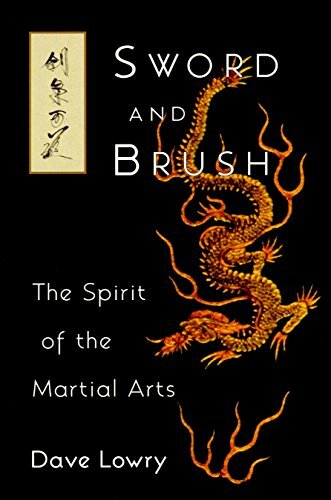 At some point in his career, approximately 1830, he went to China and studied the Shaolin style of Chinese Kenpo (fist method) and weaponry. It is also known that he travelled to Foochow in Fukien province, China on numerous occasions as an envoy for the Okinawan King. After his return from China he organized and refined the Shorin Ryu system of Okinawan Karate. His main instruction came from Sakugawa. Matsumura was given the title "Bushi" meaning warrior by the Okinawan King in recognition of his abilities and accomplishments in the martial arts. In fact, Matsumura fought many times but was never defeated. His martial arts endeavours has been the progenitor of many contemporary karate styles, Shorin Ryu, Shotokan Ryu, and Shito Ryu, for example. Ultimately all modern styles of karate that evolved from the Shuri-Te lineage can be traced back to the teachings of Bushi Matsumura. This includes Taekwon-do (Korean Karate). Matsumura's Makimono (scroll) or Precepts of Matsuura. 3) the study of jukyo. The study of shisho refers to commanding words and communicative skills. The study of kunko refers to a comparative study in the philosophy of ancient documents and teaching a sense of duty through example. Yet, in spite of their uniqueness, they are incapable of finding the Way. Capturing only a shallow understanding of the literary phenomenon, shisho and kunko cannot, therefore, be considered complete studies. 6) in doing so make our home a more peaceful place - a precept which can also apply to our country or the entire world. This then is a complete study and it is called jukyo. 3) budo no bugei, the genuine methods which are never practiced without conviction, and through which participants cultivate a serene wisdom which knows not contention or vice. With virtue, participants foster loyalty among family, friends, and country, and a natural decorum encourages a dauntless character. These are called the "Seven Virtues of Bu," and they have been venerated by the seijin (sagacious person or persons; most probably Chinese Confucians) in the document titled Godan-sho (an ancient journal describing the ways of China). Hence, the way of bun bu (study of philosophy and the fighting traditions, often described as "the pen [or brush] and the sword") have mutual features. A scholar needs not gakushi or meimoku no bugei, only budo no bugei. This is where you will find the Way. This indomitable fortitude will profoundly affect your judgment in recognizing opportunity and reacting accordingly, as the circumstances always dictate the means. I may appear somewhat unsympathetic, but my conviction lies strongly in the principles of budo no bugei. If you embrace my words as I have divulged to you, leaving no secrets and nothing left hiding in my mind, you will find the Way. taken from "Tales of Okinawa's Great Masters by Shoshin Nagamine"